By John J. Raspanti, Doghouse Boxing: On November 12, archrivals Manny Pacquaio and Juan Manuel Marquez are set to square off one more time at the MGM Grand in Las Vegas, Nevada. In their first fight, Pacquaio, (53-3, 38 KOs) came out of the gates like an unbroken mustang. He knocked Marquez (53-5, 39 KOs) down three times and broke his nose. Somehow, the gutsy Mexican warrior survived, and by round four, he was back in the fight. With Marquez showing the resiliency of a superhero, the fight turned into a war of attrition with both fighters landing wicked shots. Marquez staggered Pacquaio in round seven and again later in the fight. The decision, when announced, disappointed everyone. A draw demanded a rematch, which unfortunately took four years to secure. In 2008, they met for the second time. Marquez, jumped out to a lead on all the scorecards, but Pacquiao possesses the great equalizer. With his back against the ropes, he unleashed it, flooring Marquez with a perfectly thrown inside hook that Marquez never saw. By the end of the fight, Pacquiao’s face was bloody and battered. The judges awarded Pacquiao the decision by one point, which infuriated the Marquez camp. Though respectful of his ability Pacquiao has grown tired of Marquez’s constant complaining about the decisions. For his part, Marquez is just as determined as Pacquiao. "Now it's time to shed doubt over who the best fighter is," Marquez said during a conference call. ”I want to win this fight because I believe I won the first two fights." Marquez is a tremendous fighter at 135 pounds. Though slowing down a bit at age 38, he continues to be one of the most impressive combination punchers the sport has produced in the last twenty years. He’s tough as nails and as determined as a bull stalking a matador. This aggressiveness could be his undoing. Marquez has hit the canvas six times in his professional career, four of those from punches administered by Pacquiao. The 32-year-old Pacquiao has improved dramatically since 2004 with the help of trainer Freddie Roach. Other than his fights with Marquez and Eric Morales, Pacquiao has dominated his opposition. 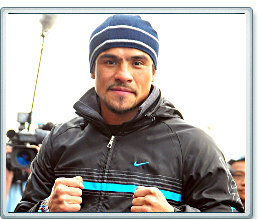 His bouts have been clinics in brutality (Antonio Margarito); beat downs (Miguel Cotto); and shutouts (Joshua Coffey). Pacquiao’s speed gave Marquez fits during their previous bouts. A bulked up Marquez could be an eyelash slower. Pacquiao should be able to exploit some of Marquez's flaws. Another intangible is the desire of both fighters. Marquez talks of revenge but it’s Paquaio who has more to lose. He genuinely seems annoyed at some of Marquez’s antics, like wearing a tee shirt in public that proclaims “WE WERE ROBBED”. Paquaio's annoyance at Marquez's insolence is obvious. Marquez has indicated that he has no fear of Pacquaio. The only thing Pacquiao might fear is his wife, who might be drawing up divorce papers. As the countdown to the fight gets closer, Pacquiao looks primed and ready to go. As for the fight, it’s virtually impossible to pick against Pacquaio. His advantages in speed and power will reveal themselves immediately. Marquez will have his moments again, connecting with lead rights on Pacquiao’s chin. However, the determined little man from the Philippines will soldier on, breaking down and ultimately stopping Marquez late in the fight.